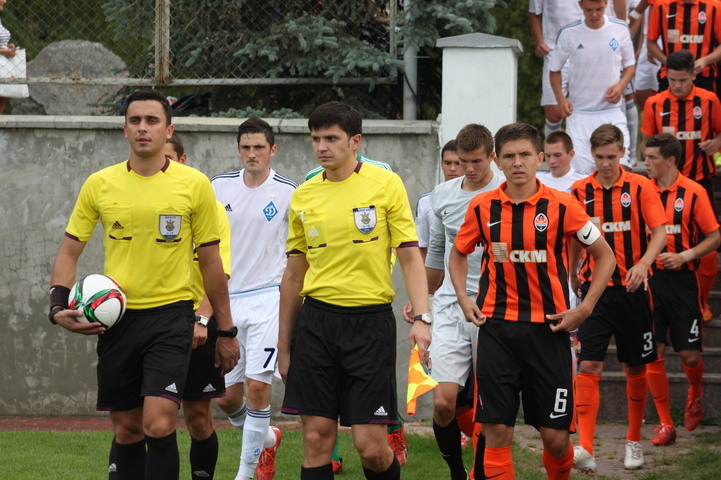 In a match of the 4th round of the Ukrainian League, U19 Shakhtar team played Dynamo away. The situation in the standings added more importance to this encounter. After three games played, the opponents scored six points each and in this confrontation decided who would get a toehold among the top five league sides. As was expected, both teams fielded their best line-ups. The Pitmen charged forward from the opening minutes. Already in the second minute, the Donetsk side brought Pikhalyonok into the goal-scoring position, but his shot flew just inches over the crossbar. Dynamo did not sit deep for long and seized the initiative, holding Shakhtar back in the latter’s half. Smyrnyi was close to opening the scoring. The hosts’ number one went one on one with Trescheyko, with Shakhtar’s keeper winning the duel . On 23 minutes, the Kyiv side still opened the scoring. This time, Schebetun squeezed between two defenders and pushed the ball into the net. The Pitmen rushed to level it. Avagimyan sharply crossed it into the penalty area, causing a Dynamo player nearly send the ball into the back of his own net. And on 40 minutes, the hosts managed to secure the lead. The Donetsk team lost the ball in their half. The episode ended with a precision shot by Tymchyk. In the dying seconds of the first half, Fursov brought down Schebetun in the penalty area. The referee awarded a penalty kick, with Trescheyko guessing the corner right and saving the spot kick. After the break, the Kyiv side just parked the bus. Shakhtar were looking for ways to approach the goal of Dynamo, running into the opponents’ tight defence all the time. Fursov had the only chance to score. After a corner on 60 minutes, Yaroslav took a shot at goal from a few metres’ range, but hit the goalkeeper. In general, the Orange-Blacks actively attacked through the flanks, using lobs and crosses into the penalty area. But it never resulted in a finishing touch. Dynamo claimed a 2-0 win. - In order to win every match, it is necessary to take to the football field being maximally focused and ready for fighting and challenges from the first to the last second. And individual brilliance should be delivered directly in the game. I think that we lost naturally. We were not as mobile as our opponents. Our main problem is a great number of errors in simple situations. This makes it difficult to achieve results and to grow for each player and the team as a whole. We will review the mistakes and work on them. Only after solving the problem of individual mistakes, we will be talking about tactics and so on. Besides, Hlahola has got injured today. He was immediately replaced. We still don’t have the full details of the nature of his injury, but according to preliminary data he got lucky, there’s nothing serious. We wish him a speedy recovery and return to the team. A footballer’s health is the most important thing. - We made numerous mistakes, causing ourselves two goals. The Kyiv side marked us in every area of the field, giving us no space for action, making it very hard. We had to continually knock it up field because we lost the ball and immediately suffered an attack on our goal. Fortunately, I managed to clear the penalty, I just guessed the angle right. However, prior to that I’d made a mistake and lost the ball. In the first half, the opponents had another one-on-one situation, in that episode I had time to take a good position and we saved our goal. Shakhtar U19 will play their next game on 30 August against Metalurh Zaporizhzhya in Schaslyve. The match will kick off at 17:00.